Orthodoxy is the true knowledge of God and reverence of God. Orthodoxy is the worship of God in Spirit and in Truth. Orthodoxy is the glorification of the true God, the knowledge of Him and worship of Him. Orthodoxy is the glorification of God by man, the true servant of God, given to him through the grace of the Holy Spirit. The Spirit is the glory of the Christian (cf. Jn 7:39). Where there is no Spirit, there is no Orthodoxy. There is no Orthodoxy in human teachings and philosophies; false reason reigns in them—the fruit of the fall. Orthodoxy is the teaching of the Holy Spirit given by God to man for his salvation. Where there is no Orthodoxy, there is no salvation. "Whosoever will be saved, before all things it is necessary that he hold the Catholic [meaning: universal] Faith. Which Faith except every one do keep whole and undefiled; without doubt he shall perish everlastingly" (from the Creed of St. Athanasius). The teaching of the Holy Spirit is a precious treasure! It was taught in the Holy Scriptures and the sacred traditions of the Orthodox Church. The teaching of the Holy Spirit is a precious treasure! In it is the guarantee of our salvation. Our blessed portion in eternity is precious; nothing can take its place, and it is comparable to nothing. The teaching of the Holy Spirit is just as precious, just as high above all other values, and a guarantee of our blessedness. In order to preserve this guarantee for us, the holy Church recounts today for all to hear the teachings that were spawned and published by satan—teachings which are an expression of his enmity toward God, and which suggest slander concerning our salvation, robbing us of it. The Church rebukes these teachings as we would rebuke wolves seeking prey, deadly snakes, thieves, and murderers. Guarding us from them and calling back from perdition those who were deceived by them, the Church anathematizes those teachings and all who stubbornly adhere to them. The word anathema means severance, rejection. When the Church anathematizes a teaching, it means that that teaching contains blasphemy against the Holy Spirit, and for the sake of salvation it should be rejected and removed, as poison is removed from food. When a person is anathematized, it means that he has irreversibly adopted a blasphemous teaching, and through them deprives himself and those near him, to whom he has imparted his line of thought, of salvation. When a person has made the commitment to abandon the blasphemous teaching and to receive the teachings upheld in the Orthodox Church, he is obligated, according to the rules of the Orthodox Church, to anathematize the false teaching that he formerly upheld, which was destroying him, alienating him from God, keeping him locked in enmity against God, in blasphemy against the Holy Spirit and communion with satan. The meaning of anathema is the meaning of the Church's spiritual cure of an illness in the human soul, which causes eternal death. All human teachings cause eternal death if they introduce their own thinking drawn from reason falsely so-called, from carnal mindedness—that common heritage of fallen spirits and men—into the God-revealed teaching about God. Human philosophies introduced into the teachings of the Christian Faith are called heresies, and adherence to these teachings is called evil belief. Hearing today the dreadful pronouncement of spiritual cure, let us accept it with the true understanding of it; and pressing it to our souls, let us sincerely and decisively renounce those destructive teachings that the Church will strike down with anathema unto the salvation of our souls. If we have always renounced them, then through the voice of the Church let us confirm our renunciation of them. The spiritual freedom, lightness, and strength that we will unfailingly feel within ourselves is a testimony to us of the rightness of the Church’s action, and the truth of the teaching it proclaims. As we therefore bless and praise those who have obeyed the divine revelation and have fought for it; so we reject and anathematize those who oppose this truth, if while waiting for their return and repentance, they refuse to turn again to the Lord; and in this we follow the sacred tradition of the ancient Church, holding fast to her traditions. To those who deny the existence of God, and assert that the world is self-existing, and that all things in it occur by chance, and not by the providence of God, Anathema. To those who say that God is not spirit, but flesh; or that He is not just, merciful, wise and all-knowing, and utter similar blasphemies, Anathema. To those who dare to say that the Son of God and also the Holy Spirit are not one in essence and of equal honor with the Father, and confess that the Father, and the Son, and the Holy Spirit are not one God, Anathema. To those who foolishly say that the coming of the Son of God into the world in the flesh, and His voluntary passion, death, and resurrection were not necessary for our salvation and the cleansing of sins, Anathema. To those who reject the grace of redemption preached by the Gospel as the only means of our justification before God, Anathema. To those who dare to say that the all-pure Virgin Mary was not virgin before giving birth, during birthgiving, and after her child-birth, Anathema. To those who do not believe that the Holy Spirit inspired the prophets and apostles, and by them taught us the true way to eternal salvation, and confirmed this by miracles, and now dwells in the hearts of all true and faithful Christians, and teaches them in all truth, Anathema. To those who reject the immortality of the soul, the end of time, the future judgment, and eternal reward for virtue and condemnation for sin, Anathema. To those who reject all the holy mysteries [sacraments] held by the Church of Christ, Anathema. To those who reject the Councils of the holy fathers and their traditions, which are agreeable to divine revelation and kept piously by the Orthodox Catholic Church, Anathema. (From the Service of the Sunday of Orthodoxy). Divine Truth became incarnate to save through Himself us who have perished by accepting and adopting a murderous lie. Then said Jesus to those Jews which believed on him, If ye continue in my word, then are ye my disciples indeed; and ye shall know the truth, and the truth shall make you free (Jn 8:31–32). Only he is faithful to the teachings of Christ who decisively renounces and ever rejects all those teachings once conceived and still being conceived by outcast spirits and lawless people, inimical to Christ's teaching, to God's teaching—slandering its integrity and inviolability. The integrity of the God-revealed teaching is preserved inviolable solely and exclusively in the bosom of the Eastern Orthodox Church. The website Journey to Orthodoxy shares the Journey stories about how people from all walks of life and from various belief systems have come to embrace the truth of Orthodoxy. Father Patrick Henry Reardon, Priest of All Saints Orthodox Church in Chicago, gave this deep and insightful homily on the soul in 2014. It is 25 minutes in length. Father Pat, in addition to being a Priest, is also a well known author of many books and the editor of Touchstone Magazine. Click here for the Orthodox Church of America's website. This site offers information regarding Feasts and Saints, Scripture readings, Music and Texts. Find a parish near you, read articles, view photos and find answers to frequently asked questions. Archaeologists claim to have found what looks like the earliest Christian Church dating from AD 33-70. READ MORE! We gather this evening to celebrate the Sunday of Orthodoxy and to pray together at this peaceful yet glorious Pan-Orthodox Vespers service with the wonderful antiphonal singing by the Spirit of Orthodoxy choir and the Cathedral cantors. Especially in North America, this day has become a day for Orthodox Christians to come together with thanksgiving to Almighty God in order to celebrate our unity and our common joy at the restoration of the holy icons. I am grateful to His Eminence, Metropolitan Joseph, the Archbishop of New York and Metropolitan of All North America for the Antiochian Archdiocese, and a dear friend in Christ, for his great kindness in inviting me to be with you this evening. The friendship and brotherhood between the Orthodox Church in America and the Antiochian Orthodox Archdiocese is long-standing and deep, and it is wonderful to be here this evening, along with His Eminence, Archbishop Michael, from the Orthodox Church in America’s diocese of New York and New Jersey, and His Grace, Bishop John, from the Antiochian Diocese of Worcester, in this beautiful Cathedral, dedicated to Saint Nicholas, the Wonderworker. I am sure I speak for all of us in expressing thanks to the Dean, Father Thomas Zain, and the clergy, leadership and faithful of this community, for their wonderful hospitality this evening.... read more. The Holy Martyrs Eutropius, Cleonicus and Basiliscus suffered in the city of Pontine Amasea (Asia Minor) in about the year 308. 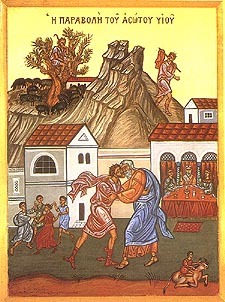 The brothers Eutropius and Cleonicus, and Basiliscus the nephew of the Great Martyr Theodore the Recruit (February 17), were comrades. After the martyric death of Saint Theodore, they wound up in prison and by their preaching brought many of the pagans in prison with them to the Christian Faith. When he tortured Saint Theodore, Publius perished shamefully, struck down by divine wrath. Asclepiodotus was chosen as ruler of Amasea, and was more inhumane than his predecessor. Knowing the comrades of Saint Theodore the Recruit were all in prison, the governor commanded that they be brought to him. Saints Eutropius, Cleonicus and Basiliscus thus firmly confessed their faith in Christ before this new governor. They were mercilessly beaten, so that their bodies were entirely bruised. Soldiers and many of the people standing nearby were also granted to behold the Savior. They urged Asclepiodotus to halt the tortures. Seeing that the people were distraught and ready to believe in the true God, the governor commanded the martyrs to be taken away. The governor then invited Saint Eutropius to supper and urged him to offer public sacrifice to the pagan gods, yet remain a Christian in soul. Eutropius refused this offer. The tar began to flow beside the bodies of the martyrs, like water with marble, scorching the torturers. Those seeing this fled in terror, but the governor in his bitterness gave orders to rake their bodies with iron hooks and to sting their wounds with mustard mixed with salt and vinegar. The saints endured these torments with remarkable firmness. The night before their execution the saints spent their time at prayer, and again the Lord appeared to them and strengthened them. On the morning of March 3, Saints Eutropius and Cleonicus were crucified, but Basiliscus was left in prison. Saint Basiliscus was executed on May 22 in the city of Komana. They beheaded him, and threw his body into a river, but Christians found his relics and buried them in a ploughed field. Later at Komana a church was built and dedicated to Saint Basiliscus. All mortal life is but one day, so it is said, to those who labour with love. There are forty days in the Fast: let us keep them all with joy [Canticle IX of the Canon, Monday of the First Week]. We may not live in Thessalonica in the 14th century, but I know that every Orthodox Christian has experienced the change that takes place during the First Week of Great Lent, both inwardly and outwardly. Though we are a small and humble Church on a very large continent, I pray that we all may continue to bear witness to Christ in this fallen world and that, by God’s grace, the transfiguration of our hearts, our communities and our society by the light of Christ and the resurrection, will continue for the life of the world and it’s salvation. Please forgive me and pray for me, a sinner. The Sunday after the Sunday of the Publican and the Pharisee is the Sunday of the Prodigal Son. This parable of God’s forgiveness calls us to come to ourselves” as did the prodigal son, to see ourselves as being “in a far country” far from the Father’s house, and to make the journey of return to God. We are given every assurance by the Master that our heavenly Father will receive us with joy and gladness. We must only “arise and go,” confessing our self-inflicted and sinful separation from that “home” where we truly belong (Luke 15:11-24). After the Polyeleion at Matins, we first hear the lenten hymn “By the Waters of Babylon.” It will be sung for the next two Sundays before Lent begins, and it serves to reinforce the theme of exile in today’s Gospel. 11 Then He said: “A certain man had two sons. 12 And the younger of them said to his father, ‘Father, give me the portion of goods that falls to me.’ So he divided to them his livelihood. 17 But when he came to himself, he said, ‘How many of my father’s hired servants have bread enough and to spare, and I perish with hunger! 20 And he arose and came to his father. But when he was still a great way off, his father saw him and had compassion, and ran and fell on his neck and kissed him. 22 But the father said to his servants, ‘Bring out the best robe and put it on him, and put a ring on his hand and sandals on his feet. 24 ’for this my son was dead and is alive again; he was lost and is found.’ And they began to be merry. 25 Now his older son was in the field. And as he came and drew near to the house, he heard music and dancing. 28 But he was angry and would not go in. Therefore his father came out and pleaded with him. 29 So he answered and said to his father, ‘Lo, these many years I have been serving you; I never transgressed your commandment at any time; and yet you never gave me a young goat, that I might make merry with my friends. 31 And he said to him, ‘Son, you are always with me, and all that I have is yours. The first thing to say, from an Orthodox perspective, is that there is no such thing as time management. We don’t manage time. Time manages us if we allow the Lord to have a place in our schedule. Christ is everything, including the giver and owner of our time. He is the Way we format our schedule, the Truth about the meaning of time, and the flow of Life that moves us through time. By contrast, we can begin with the assertion that time is not our own. Time belongs to the Lord and He has a plan for time that He desires us to accept for our own peace and joy. Those who are trying to use their time to do the Lord’s will must begin every day, and every moment, with Jesus Christ. One question might be, “Lord, what do you want me to do, now?” But an even better question is, “Lord, what do you want to do through me now?” This takes the emphasis from the ego and places it on the Lord. If we believe that God has a plan for each moment, we can then be sensitive to each moment as it unfolds in unexpected ways. When we receive each moment as from the Lord we will begin to experience our time on earth as a series of small deaths and resurrections. Every loss is a gift that God gives us so that He can give us more. It might be saying goodbye to high school or college days, a move from the old neighborhood, the loss of a job, the loss of physical or mental health. We might lose loved ones through separation or death. In degrees, the reactive thought might be, “This is the beginning of the end.” A more truthful thought would be, “This is the beginning of the beginning.” Death is the beginning of a new relationship with Christ, a fresh beginning of an entirely new life. Each loss and little death is a new beginning towards our ultimate beginning—heaven. As we adjust our expectations time takes on a new meaning. Simple awareness of the presence of God is the power within the present moment. The present moment—now—is the only place where God is. He discloses Himself through the reality of the present moment. Nowhere else. This is a mystery we can participate in by simply trying to be aware of His presence. Awareness, conscious contact with God, is the key. An Orthodox morning prayer by Metropolitan Philaret says: “In unforeseen events let us not forget that all are sent by Thee.” Here it is helpful to refine exactly what is meant by the idea that God sends all moments. God did not send terrorists to fly planes into the World Trade Center in New York City. Rather, God allowed terrorists to fly those planes. What, then, is implied by the all in Metropolitan Philaret’s prayer? An Orthodox perspective would say that events outside ourselves are subject to God’s allowing will, and moreover are beyond our understanding. However, by faith we believe and confess that God sends all of the events that pertain to us. All events in our day, even those that we anticipate in a human way, can legitimately be described as “unforeseen,” because they bear a divine potential which is not revealed to us in advance. But even “unforeseen events,” in the most mundane sense of the term—the unforeseen phone call or the inconvenient request—can take on a new meaning, simply because our time is not our own. Our freedom consists in embracing all that happens to us, exhaustion and all, as a blessing in divine disguise. There is a paradox inherent in the Orthodox approach to time. We do not “manage” our time yet we must be prudent and skillful in the way we use our time. We must plan without being a slave of our plans. So, we are back to basics. We need to allow the Lord to flow through us all the time, as best we can. Sometimes we must use the present moment to plan for tomorrow and the long-term future. But, again, it is the Lord doing the planning through us. When we finish the planning we can’t obsess about it or allow the plans to become larger than life. We must be stable in the present moment and flexible enough to change plans as the Lord directs, at a moment’s notice. One saint said she wanted to be a ball on a table top in the hands of the Lord, allowing Him to move her anyway He chose, for His pleasure. We, however, often have other ideas. Enter stress and dissatisfaction. We make our own stress, in large part. We can only be ready for virtually anything if we know what else we have to do and choose to not do. Then we can do or not do what appears in the moment, based on a deep intuition of what the Lord is calling for now. All too often we walk through life responding to the “latest and loudest” voice clamoring for our attention. David Allen in his interesting book, Ready for Anything, emphasizes a few key points. We need to have some system where we have written down everything we need to do. These are called projects, anything that requires more than one step to accomplish. We also need a list of next action steps, those things that can be accomplished in one action. These next actions can be grouped into categories that make life better organized. We might group together all the next actions which require a computer, or the phone, or when talking with my boss. Then, when we are at the phone or have a slice of free time, we will know what calls we might or might not make on the spot. All this helps us think less about what we need to do. The brain is a fine instrument for creative thought but a poor container to remember all the outstanding commitments and projects that are ours. When projects and next actions are written down, and backed up, in some trusted system, we can allow the system to remember for us. For computer users, an external hard drive can serve as a trusted backup system. For those who prefer pen and paper (and this number is growing), a copy should be made of all that is written down. A backup is necessary because we must feel free from the possibility that we wrote down everything we need to do and that list got misplaced, or thrown out with the trash, or mauled by a well-meaning pet. The idea is to free our mind from worry about commitments we have made with ourselves and others. Then we can use our brain for other things. If we try to keep our commitments in our head, like a computer with too much in the memory, the entire system slows down. We need to take copious notes and be willing to process and organize these notes at least weekly so we have more freedom in the way we use our time. To be free in the Lord requires that we are as free as we can be from internal baggage and preoccupation. David Allen calls this “Mind like water,” that is, a mind ready to receive the next pebble thrown in and naturally allow the ripples to move out. To let the Lord work through us means that we give him space, and, of course, time. All too often we act reactively. Our responses often take the form of a stimulus-response reaction. Too many times we want to say, “Yes” to all the requests that come our way, and they all may have great merit. But then, one can get so overloaded and overburdened. However, it is not always easy to discern to what we should say “yes” or “no.” It does require growing closer to the Lord, to hear His voice and His direction. Often, we do not go in the direction to which He has pointed. However, we take comfort in the knowledge that He is the Great “GPS”. He is always ready to “recalculate” and reroute us. One handy suggestion is to push pause as often as we can. We can pause between the stimulus and our response, thereby gaining perspective. The pause itself is usually sufficient to break the reactivity cycle. We can become aware of something else going on besides the unconscious reaction. This is a fine opportunity to try to remember that we are in the holy presence of God. A way to gain more conscious contact with God is to gently and quietly say, “Jesus.” His holy Name is an expression of belief, adoration, expectation of salvation and unity with Him and all the members of His body. His name is sacred and is a power He asked us to use. “Hitherto you have asked nothing in my name. Ask and you shall receive, that your joy may be full.” (John 16:23) We need to know that when we use His Name we are acknowledging that we are his disciples. We pause and say His Name, as an act of obedience and surrender of the present moment. We can match this with an awareness of our breathing, centering us more inside our body. We can simply say the one word, “Jesus,” to transfigure what is in front of us, or in our minds. The name Jesus can be a filter through which our thoughts, words and deeds have to pass to be freed from their impurities. Needless to say, this is severe spiritual warfare. It requires a forgetfulness of the self, a dying to the negative thoughts the ego wants to indulge. Time manages us because the Lord lives within the time He gives us. So, it is He, through the reality we call measured time, who manages, leads, nourishes and strengthens us. We don’t live life. Life lives us. Dr. Albert Rossi is a clinical psychologist who teaches classes in pastoral theology at St. Vladimir’s Seminary. He has a bi-weekly podcast called Becoming a Healing Presence on Ancient Faith Radio. Julia Wickes earned a master’s degree from St. Vladimir’s Seminary and currently lives in St. Louis, MO. The Holy Martyr Dorothy, the Martyrs Christina, Callista and the Martyr Theophilus lived in Caesarea of Cappadocia and suffered under the emperor Diocletian in either the year 288 or 300. Saint Dorothy was a pious Christian maiden, distinguished by her great beauty, humility, prudence, and God-given wisdom, which astonished many. Arrested upon orders of the governor Sapricius, she steadfastly confessed her faith in Christ and was subjected to tortures. Failing to break the will of the saint, the governor sent to her two women, the sisters Christina and Callista, who once were Christians, but fearing torture, they renounced Christ and began to lead impious lives. He ordered them to get Saint Dorothy to offer sacrifice to the pagan gods, but just the reverse happened. Saint Dorothy convinced them that the mercy of God is granted to all who repent, so they corrected themselves and returned to Christ. The tormentors tied them back to back and burned them in a vat of tar. Through martyrdom, Christina and Callista atoned for their sin of apostasy, receiving from God not only forgiveness, but crowns of victory. At the place of execution, the saint requested a little time to pray. When she finished the prayer, an angel appeared before her in the form of a handsome child presenting her three apples and three roses on a pure linen cloth. The saint requested that these be given to Theophilus, after which she was beheaded by the sword. Having received the gracious gift, the recent mocker of Christians was shaken, and he confessed Christ as the true God. His friends were astonished, and wondered whether he were joking, or perhaps mad. He assured them he was not joking. Then they asked the reason for this sudden change. He asked what month it was. “February,” they replied. “In the winter, Cappadocia is covered with ice and frost, and the trees are bare of leaves. What do you think? From where do these apples and flowers come?” After being subjected to cruel tortures, Saint Theophilus was beheaded with a sword. The relics of Saint Dorothy are in Rome in the church dedicated to her, and her head is also at Rome, in a church of the Mother of God at Trastevero. His Beatitude, Metropolitan Tikhon joined several other Orthodox Christian hierarchs and a large number of clergy, seminarians, and faithful at the annual gathering, during which they witnessed to God’s gift of life and the need to speak out on behalf of the unborn. On Thursday evening, February 26, Metropolitan Tikhon joined His Eminence, Archbishop Melchisedek; His Eminence, Archbishop Nathaniel; His Grace, Bishop Dimitrios of the Greek Orthodox Metropolis of Chicago; and His Grace, Bishop John of Brooklyn of the Antiochian Orthodox Christian Archdiocese of North America at the Vigil celebrated at the National Shrine of the Immaculate Conception, which was filled to capacity. Representatives of the Oriental Orthodox Church also were present. Continuing by explaining that Orthodox Christianity “places heavy emphasis on the eternal life given to us by God, ” Metropolitan Tikhon observed that the March provides an opportunity to join with others—including the many young people present—in sharing a “message of hope for the world.” He also spoke of the cooperative efforts by the Orthodox, the Oriental Orthodox and the Roman Catholics with regard to their “common witness” in “demonstrating a common understanding” of God’s gift of life. After the pre-March program and speeches, Metropolitan Tikhon celebrated a Service of Prayer for the victims of abortion on the site of the pre-March program. His Eminence, Archbishop Michael joined the hierarchs, clergy, seminarians and faculty members, and many faithful at the service, who then marched together behind the iconic “Orthodox Christians for Life” banner. Metropolitan Tikhon also offered the invocation at the annual Rose Banquet, at which he was joined by the other hierarchs, members of the Orthodox Church in America’s Central Administration, representatives of Saint Vladimir’s Seminary and Saint Tikhon’s Seminary, and many others. A photo gallery is now available on the OCA web site and Facebook page. Additional information will be posted as it becomes available. The Hieromartyr Clement was born in the Galatian city of Ancyra in the year 258, of a pagan father and a Christian mother. He lost his father when he was an infant, and his mother when he was twelve. She predicted a martyr’s death for him because of his belief in Christ. A woman named Sophia adopted him and raised him in the fear of God. During a terrible famine in Galatia several pagans turned out their own children, not having the means to feed them. Sophia took in these unfortunates, and fed and clothed them. Saint Clement assisted her in this. He taught the children and prepared them for Baptism. Many of them died as martyrs for Christ. Saint Clement was made a reader, and later a deacon. When he was eighteen he was ordained to the holy priesthood, and at age twenty he was consecrated Bishop of Ancyra. Soon afterwards the persecution against Christians under Diocletian (284-305) broke out. Bishop Clement was denounced as a Christian and arrested. Dometian, the governor of Galatia, tried to make the saint worship the pagan gods, but Saint Clement firmly confessed his faith and valiantly withstood all the tortures. Many of the pagans, seeing the bravery of the saint and the miraculous healing of his wounds, believed in Christ. People flocked to Saint Clement in prison for guidance, healing and Baptism, so that the prison was literally transformed into a church. When word of this reached the emperor, many of these new Christians were executed. Diocletian, struck by the amazing endurance of Saint Clement, sent him to Nicomedia to his co-emperor Maximian. On the ship, the saint was joined by his disciple Agathangelus, who had avoided being executed with the other confessors, and who now wanted to suffer and die for Christ with Bishop Clement. The emperor Maximian in turn sent Saints Clement and Agathangelus to the governor Agrippina, who subjected them to such inhuman torments, that even the pagan on-lookers felt pity for the martyrs and they began to pelt the torturers with stones. In Amasea, the martyrs were thrown into hot lime. They spent a whole day in it and remained unharmed. They flayed them, beat them with iron rods, set them on red-hot beds, and poured sulfur on their bodies. All this failed to harm the saints, and they were sent to Tarsus for new tortures. In the wilderness along the way Saint Clement had a revelation that he would suffer a total of twenty-eight years for Christ. Then having endured a multitude of tortures, the saints were locked up in prison. Saint Agathangelus was beheaded with the sword on November 5. The Christians of Ancyra freed Saint Clement from prison and took him to a cave church. There, after celebrating Liturgy, the saint announced to the faithful the impending end of the persecution and his own martyrdom. On January 23, the holy hierarch was killed by soldiers from the city, who stormed the church. The saint was beheaded as he stood before the altar and offered the Bloodless Sacrifice. Two deacons, Christopher and Chariton, were beheaded with him, but no one else was harmed. When Christ approached the River Jordan to go down into its waters, John the Baptist trembled. With spiritual vision, he recognized the Lord that day, for they had met years earlier, before either of them had yet emerged from their mothers’ wombs. Elizabeth felt John leaping within her upon hearing the voice of the Holy Virgin. John’s little heart already burned with joy at perceiving the presence of Him Who was to take away the sins of the world. John was to spend his entire life preparing for a future encounter with this same Lamb of God, but what happened that day at the river was unlike anything he could have foreseen. Christ, who had no sins of His own, took the weight of our sins upon Himself. At the Jordan, He submitted to a ritual purification of sins, in order to cleanse us from the grime of the passions. He descended into the waters as into a grave, so that we might be given new and everlasting life. These bright themes echo in our ears in early January each year with the Church’s celebration of the Feast of Theophany. The joy of sins forgiven, of hearts made clean, of spiritual eyes washed and illumined by the shining face of Christ: these are joys that “no one can take away from us” (cf. John 16:22). It is only with such corrected vision, with such purified thoughts and hearts that, later in January each year, we can turn our attention, with sobriety and indeed with sorrow, to the anniversary of the Roe v. Wade Supreme Court decision and all that it entails. And what, in fact, has legalized abortion led to? We need to ask this question and provide a frank, if only partial, answer, because in the nearly five decades since Roe, a deep cultural and moral cynicism has set in, and I fear that our ears, our minds and our hearts may have grown dull to the full horror of abortion. For many, this is but one among several political “issues”—stale, overemphasized, and divisive—while for others, it can bring long-hidden pain and grief to the surface. In either case, the Church, so it is sometimes suggested, is better off not speaking out. The Lord, however, has endued His Church with a voice of mercy and truth, a voice of righteousness and peace (cf. Psalm 84:10). And as long as Rachel continues to weep for her children because they are no more, the Church’s voice cannot be silent (cf. Matthew 2:18). Therefore, the Church cannot refrain from consoling women who, for whatever reason—whether pressured or abandoned by others or overwhelmed by a sense of helplessness or despair—have had recourse to abortion. Where there is grief, the Church must offer hope; where there is trauma, she must offer healing, and where there is repentance, she must offer forgiveness and reconciliation. The Church also has a perennial duty to educate her younger members about the sanctity of marriage and sexuality which are inextricably bound to the holy gift of new life. Where the world eagerly teaches our youth to identify with and serve their passions, adult Christians, by their word and example, must form them in a life of ascetic restraint, without which the passions bring about turmoil and destruction. And, perhaps more controversially but no less true, the Church must provide a prophetic witness and forthright correction to the powerful of this world, to the abortion industry and those who give it financial and legal support. By introducing lethal instruments into the sacred intimacy of a mother’s womb, the abortion industry has succeeded in commodifying human vulnerability and fragility. While deeming itself a provider of “reproductive health,” it leaves in its wake the wreckage of psychological and physical trauma, spiritual ruin, and a death toll of staggering proportions, all the while amassing its own profit and prestige. No Christian can “stand with” such evil. No Church can fail to denounce it. Our words, of course, must be confirmed by our deeds. In the many grassroots efforts of the Pro-Life Movement, such as neighborhood crisis pregnancy centers, volunteer counseling hotlines, and campus student groups, we see the commandment to “bear one another’s burdens, and so fulfill the law of Christ” put into action (Galatians 6:2). The humility and selflessness exhibited in such good works gives the lie to the caricature of the Pro-Life Movement as fueled by Pharisaical rancor. Indeed, the Pharisees laid heavy burdens on their neighbors’ shoulders (Matthew 23:4), but our Savior came to take away the heavy yoke of sin. He stood among sinners on the shores of the Jordan, not in order to support or condone sin, but that all the world’s sins should be laid on His shoulders. As His disciples, we have a mandate to bring all nations to Christ the Giver of Life, by baptizing them and by teaching them to observe all that He has commanded (Matthew 28:20). In our society this will often involve us in voicing unpopular opinions that, however gently and lovingly expressed, may well lead others to marginalize or reject us. The Lord repeatedly warned His disciples of this likelihood. But if we are to take part in Christ’s saving work of lightening His people’s heavy load of sin, then we cannot neglect such faithful witness. In humility, but also with boldness, we must stand with Christ. And—though the evil one tells us otherwise—Christ’s commandments are not burdensome. His yoke is easy. His burden is light (1 John 5:3; Matthew 11:30).